Win Scott Eckert.com: The Green Ghost: Declassified - Ebook out on Amazon Kindle and B&N Nook! 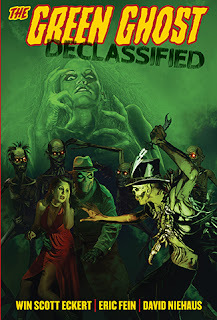 The Green Ghost: Declassified - Ebook out on Amazon Kindle and B&N Nook! Along with my fellow creators, Eric Fein, David Niehaus, and Malcolm McClinton, I'm very pleased to announce that The Green Ghost: Declassified (Moonstone Books) is now available as an ebook on both Amazon Kindle and B&N Nook! The ebook collection features seven prose tales.